I am a computer scientist, author, and independent scholar. In 2016/17 I worked for the research project Society After Money (German: Die Gesellschaft nach dem Geld), which had the goal of exploring the possibilities and challenges of a world where money, exchange, and capital no longer matter. From 2008 to early 2016 I worked as a freelance software engineer in Berlin, Germany. For the last two years I freelanced as a Python and Haskell developer for the Liquid Democracy Association. Before that, I did Java and SQL development for various companies including Zalando, Rocket Internet, and Project A. When I don't have to work, I like to write, talk, or research about peer production, free software, open hardware, and commonism. My most well-know works are about commons-based peer production and how to generalize it into the physical world. I hold a Ph.D. in computer science from the Freie Universität Berlin. My brother Martin also has a website. My uncle Dirk died in March 2016. We will not forget him. Edition C. Siefkes, Berlin, 2007. Peer production – the way in which free software projects such as GNU/Linux and free content projects such as the Wikipedia are produced – has revolutionized the areas of software and content production during the last decades. But does peer production only work for information goods, or can it have a similar effect on the production of physical goods? I have written a book discussing this question, and showing how peer production can indeed grow beyond the sphere of information. 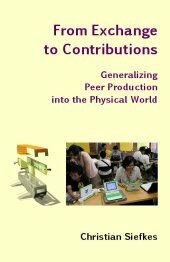 A society based entirely on peer production is possible, and this book describes how. AG SPAK Bücher, Neu-Ulm, 2008. Die deutsche Übersetzung meines Buchs From Exchange to Contributions: das Buch beschäftigt sich dem Potenzial der Peer-Produktion – der Art und Weise wie Freie Software und Freie Inhalte produziert werden. Wir wissen, dass diese neue Produktionsweise von großer Bedeutung ist, wenn es um Software und Inhalte geht – Erfolgsgeschichten wie die von GNU/Linux, Apache oder der Wikipedia sprechen hier eine deutliche Sprache. Aber mein Buch zeigt, dass das noch längst nicht alles ist: Peer-Produktion hat das Potenzial für mehr, bis hin zu einer Umwälzung der gesamten gesellschaftlichen Produktion. A simple phonetic respelling for the English language, based on the idea that spelling should be fun, not a burden. The traditional English spelling system is afflicted with exceptions and conflicting rules, making writing and reading texts unnecessary hard. Lytspel reforms the English spelling to make it strictly follow the alphabetic principle. I have contributed to various free software projects, and have also written a few (mostly small) programs of my own. On this page you can also find a list of my translations for the GNU Project and an overview of my experiences in commercial software development. I'm involved in a blog and wiki discussing whether and how the practices of free software and open content development can be extended to other areas of production, and whether an economy based on this mode of production is possible. My research on these questions has lead to a book which is available in English and German. Additionally, this page lists older texts which I wrote as a student, and more. Spam is ubiquitous, highly adapting to any counter-measures, and most annoying. This makes spam filtering one of the most important and interesting research topics in the field of text classification and text mining. Here you'll find my contributions to this effort. This page is dedicated to my Ph.D. project. 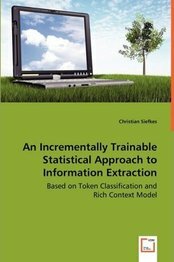 The primary goal of my Ph.D. research was to develop and evaluate a statistical system for the extraction of information from natural language texts that supports incremental training and that takes the structure of texts into account. My Ph.D. thesis, publications, and software are all available here. As a student I worked for an experimental teaching project with the purpose of giving computer science students a better insight into how to write good papers and to conduct larger research activities. As the topic area of the project we had chosen historical developments in the fields of computer science and software development; both to open up an interesting field of exploration that is largely outside the scope of usual CS teachings and to provide the students with a better understanding of the history of their own field. I'm a co-author in the German-language Keimform-Blog, a group weblog discussing whether and in which ways commons-based peer production has a potential that extends beyond the areas of free software and open content production where it has first emerged. Here you can preview my most recent contributions and the latest articles published in the blog by any author.